Congratulations are in order for Scott Grimes and Adrianne Palicki – they are getting married! The co-stars from the Fox series The Orville took to social media to announce their engagement on Thursday (January 17), hours before a new episode of the show airs. “So happy to spend my life with you @ScottGrimes #ido #iloveyou,” Adrianne captioned the photo of her and Scott cuddling on the couch. Her ring is visible in the pic! The cute couple first stepped out as a couple while promoting the show at San Diego Comic-Con last year. The Orville's Adrianne Palicki & Scott Grimes Hold Hands at Comic-Con! Adrianne Palicki and Scott Grimes hold hands while walking the red carpet at Entertainment Weekly’s Comic-Con Bash held at the Hard Rock Hotel on Saturday night (July 21) in San Diego, Calif. The actors work together on the show The Orville and were in town for a panel earlier that day. Adrianne, 35, and Scott, 47, were also seen hands while walking around the city after leaving the party. The Orville will be returning to Fox for a second season at the end of the year. “Hello, #SDCC! We love you!” Adrianne captioned the below pic on Instagram. 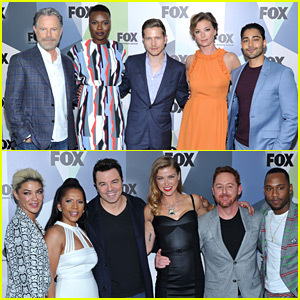 The stars of The Resident – Bruce Greenwood, Shaunette Renee Wilson, Matt Czurchry, Emily VanCamp, and Manish Dayal – gather at the Fox All-Star Party held during 2018 Upfronts Week on Monday (May 14) at Central Park’s Wollman Rink in New York City. There were so many stars from Fox shows in attendance at the event to promote the upcoming seasons! The Orville‘s Seth MacFarlane, Halston Sage, Jessica Szohr, Mark Jackson, J. Lee, Adrianne Palicki, Penny Johnson Jerald, Scott Grimes, and Peter Macon were all there. 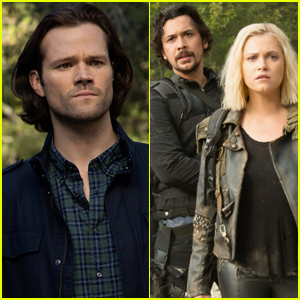 Jessica is joining the show as a series regular for season two. Also in attendance were Last Man Standing‘s Tim Allen, Gotham‘s Cory Michael Smith and Robin Lord Taylor, and The Gifted‘s Stephen Moyer, Jamie Chung, Skyler Samuels, Amy Acker, Blair Redford, Natalie Alyn Lind, Emma Dumont, Sean Teale, Coby Bell, and Percy Hynes White. Make sure to check out Fox’s fall schedule! FYI: Shaunette is wearing a Solace London dress. Jessica is wearing a Smythe blazer and pants. Octavia Spencer Brings Together Lots of Celebs For City Year's Star-Studded Event! It was a star-studded evening at City Year Los Angeles’ Spring Break: Destination Education event! Jennifer Garner and Elizabeth Banks joined host Octavia Spencer at the fundraising event held at Sony Studios on Saturday (April 28) in Los Angeles. Some of the other celeb guests included Josh Brolin and his wife Kathryn Boyd, Terry Crews, Garcelle Beauvais, Essence Atkins, Yvette Nicole Brown, Seth Green, Kevin Zegers, Thomas Middleditch, Adrianna Palicki, Jon Huertas, TR Knight, Jason Lewis, Abigail Spencer, and Eliza Coupe. Guests enjoyed booths set up by Aramark, Comcast NBCUniversal, E!, Hulu, JP Morgan Chase/Atom Tickets, Karma Tequila, MarVista, PEOPLE, RealD, Sony, Twentieth Century Fox, Univision, Walmart, and Westfield, among others. The event was attended by 1,400 guests and raised $2.2 million for education! Seth MacFarlane takes the stage at the The Orville panel at 2018 PaleyFest on Saturday (March 17) in Hollywood. 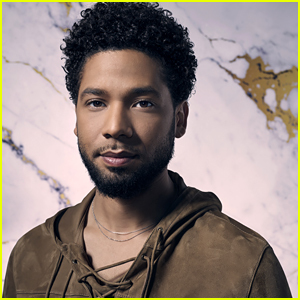 The 44-year-old actor, singer, writer, and director was joined by his cast mates Halston Sage and Adrianne Palicki to talk about their Fox show. Also in attendance were co-stars J. Lee, Peter Macon, Scott Grimes, Mark Jackson, Penny Johnson Jerald, and Chad Coleman. The Orville has recently begun production on season two, but no premiere date has been set yet. Seth previously said that it will be out later this year. The show has also added Chris Johnson and Jessica Szohr to the cast for the second season.